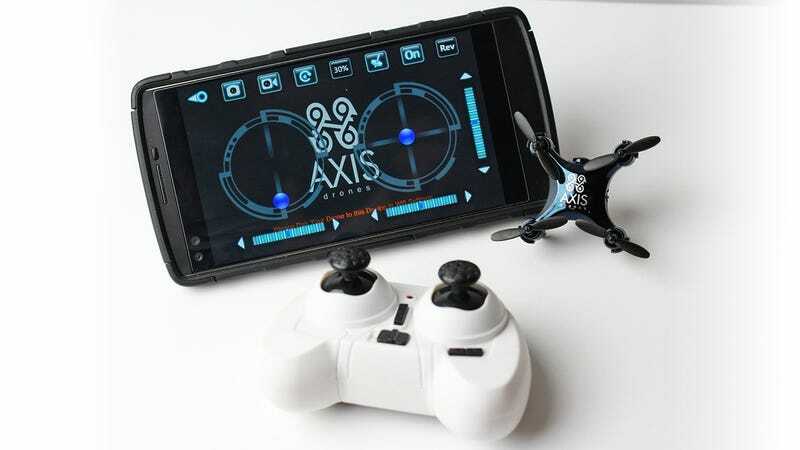 The Axis Aerius is considered to be the smallest RC quadcopter you can buy, even smaller than the company’s new Vidius drone. But that’s because Axis has managed to fit a live-streaming wi-fi video camera inside the new Vidius, giving pilots a first-person view of their flights. At just 1.7-inches in size, the Vidius quadcopter is still incredibly small, especially sitting next to the smartphone that it can send a live 420P video stream to over a direct wi-fi connection. It comes with a 2.4GHz four-channel controller allowing you to pilot the drone up to distances of 100 feet, but you can also use a free accompanying app if you’re more comfortable with touchscreen controls. Flight time for the Vidius is rated around five to seven minutes on a 20-minute charge, but that will vary based on how aggressively you’re flying, and whether or not you’re streaming live video from it. Gyro stabilization helps keep the Vidius level in flight and easy to control, but because it’s so small even the tiniest of breezes will send it careening out of control, so you might want to limit its flight plans to indoor sorties.